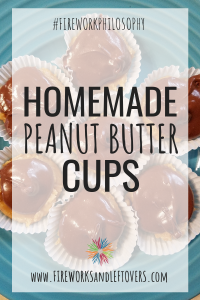 Lately, it seems like I always have to have a little something sweet at the end of each meal and these Homemade Peanut Butter Cups are a great tiny bite to satisfy that craving. I never use to be that way. I could easily go without dessert or snacking on sweet treats but that’s changed. Maybe it’s because I’m getting older. Maybe it’s because I value enjoying the little things in life (like sweets). The good thing is that a little goes a long way for me. I don’t feel the need to indulge. Just a scoop or two of ice cream is satisfying enough. Just a bite-sized piece of something rich and sweet will often do the trick. I wouldn’t say I have a full-on sweet tooth, just a desire to enjoy the sweetness in life. 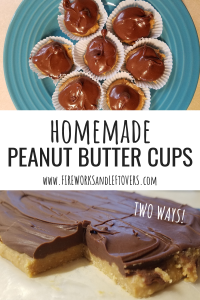 Whipping up a batch of these Homemade Peanut Butter Cups allows me to have little sweet treats on hand at home (and at work) and what’s great is that I was able to use up the last bit in the peanut butter jar that seemed to have been untouched for a while. I was also able to use up some of the powdered sugar from the pantry which is one of those things I buy for something specific and then I end up not using it that regularly. I used up a random assortment of white mini cupcake liners I had in the cupboard (or you could use festive, fun ones like these) and made what would be a truer version of a peanut butter “cup” by adding a small scoop of the peanut butter mixture to the cupcake liner, and once that set, adding the melted chocolate. I spread the rest of the batch out on a sheet of waxed paper – partially because I ran out of mini cupcake liners and partially because I was getting impatient with the small scoop process for the “cups” – and then cut the rich, peanut-buttery slab of sweetness into bite-sized squares. 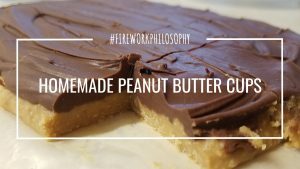 Not only will your family love these but if you take part of the batch to work, your peanut butter-loving coworkers will thank you too. Pin this recipe for later to make for Halloween or Christmas time! These rich, sweet treats are just what you need to satisfy your sweet tooth. Add melted butter, graham cracker crumbs, 3/4 cup creamy peanut butter, powdered sugar and vanilla extract to a bowl and stir to combine. Spread the mixture in an even layer on a piece of wax paper placed on a baking sheet or cake pan or add a small scoop to mini cupcake liners. Chill the peanut butter mixture for about 1 hour. Add the chocolate chips and remaining 3/4 cup peanut butter to a microwave safe bowl and microwave for 30-60 seconds, stirring every 10 seconds, until the chocolate is completely melted and the mixture is smooth. Add the chocolate mixture to the top of the chilled peanut butter mixture and chill for another 20-30 minutes or until the chocolate is set. If you made your peanut butter "cups" into bars, cut the chilled candy into bite-sized pieces. What’s your favorite peanut butter treat? Let me know in the comments below. We love all things peanut butter in my house! I make awesome peanut butter cookies…I might have to whip this recipe up for our next food day at work! I bet your PB cookies are wonderful! Yes, you’ll have to try these peanut butter cups too! They’re great for sharing.